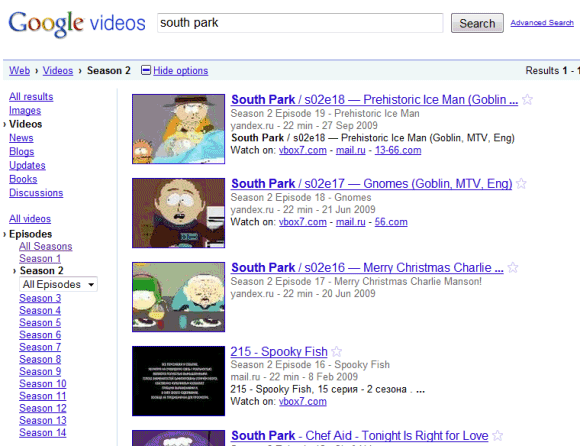 Google Video has a new filter that restricts search results to TV shows. 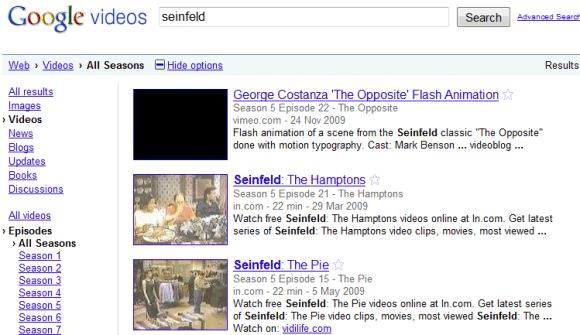 For example, if you search for [Seinfeld], Google lets you select one of the 9 seasons of the show. Google shows the name of each episode and a list of sites where you can watch it. Google doesn't restrict the results to sites that are licensed to stream TV shows, so many videos are from Russian sites like Yandex and Smotri. As you probably noticed, Google Video no longer has the option to play videos inline and Google says that there are no plans to restore it. The feature has been gradually removed from Google web search, for YouTube videos and now it's no longer available. Unfortunately, Google also indexes videos that are not watchable from outside the USA. Example for LOST : "You appear to be outside the United States or its territories. Due to international rights agreements, we only offer this video to viewers located within the United States and its territories" is displayed on ABC website.